Kadokawa Games and Chara-Ani have announced in this week’s issue of Weekly Famitsu that they are remaking the first two games in the old Langrisser series as part of a double pack for PS4 and Nintendo Switch. Titled Langrisser I&II, the remakes will be formally announced in an event on 29th August. Langrisser I was originally released in North America for Sega Genesis by Treco under the name Warsong. The rest of the series was never released officially in the West aside from Reincarnation Tensei on 3DS via Aksys Games. However, there are fan translations for some of the other games available. 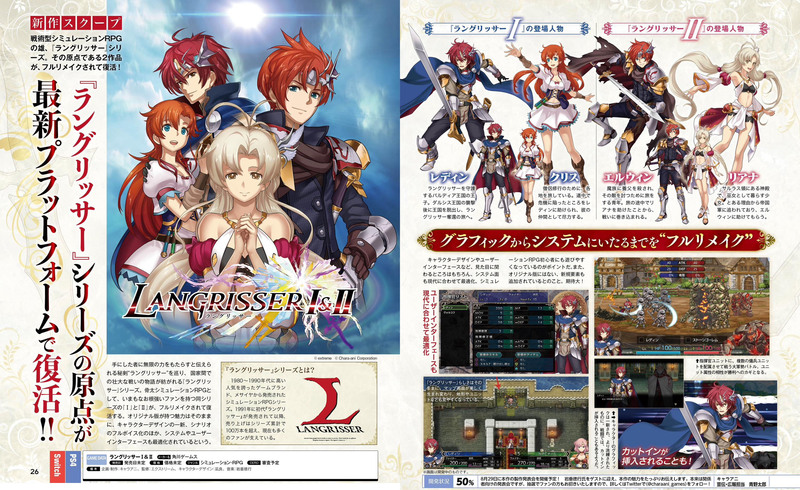 You can get the full information on Langrisser I&II below. While visual elements like character design and the user interface are of course being redone, the system side is also being optimized to suit the modern era. One point is making it easier to play for tactical RPG novices. New elements not included in the original are also being added. The map screen is being beautifully remade, making its topography, units, and so on easier to see. Character graphics have been completely remade to be more sophisticated. In battle, there may also be cut-ins that occur. Ledin – The prince of Baldea, which guards Langrisser. After the Dalsis Empire attacks on the kingdom, Ledin manages to escape, beginning his journey to recover Langrisser. Chirs – A traveling cleric pursuing her craft. Ledin saves her when she falls into danger during her travels, and from there she offers her support as an ally. Erwin – A young man on a journey to avenge his father, who was murdered by a demonic being. After he rescues Liana during his travels, he gets wrapped up in her struggle. Liana – A girl who lives at the shrine in Salrath as its maiden. For certain reasons, she is being chased by the Imperial army when she is saved by Erwin.